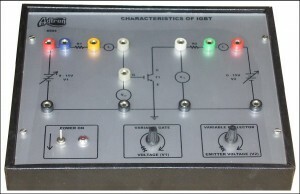 * Demonstrates the V-I Characteristics of an IGBT. * 0 – 15V / 1A. * Multicoloured sturdy 4mm test points are provided at various stages in the circuit to observe the waveforms, voltages and for necessary inter connections. * Working on 230V, 50Hz 1f AC mains.